A new exodus is taking place from Vietnam. According to the Pew Research Center, the number of Vietnamese students studying in the United States increased sevenfold between 2000 and 2014 (from 2,266 to 16,579). The same report shows that more than one third of Vietnamese students in the United States study business. Is this an indictment of Vietnam’s ability to educate the next generation of industry leaders? In a recent article, a former Vietnamese education minister admonished the country’s education system, saying “University education is so bad. Text books are full of unnecessary, tedious theory.” In the same article, a Vietnamese civil servant and mother of overseas students described the system as “all pressure and cheating.” Complaints about rote memorization and stifled creativity are also stubbornly persistent. In addition to these push-factors, pull-factors are driving the emigration of Book People. Some countries aggressively recruit foreign students to boost tuition revenue. For example, in 2014 the Canadian government announced its intent to double the size of foreign student enrolment to nearly half a million by 2022; Vietnam was identified as a “priority market,” along with China, Brazil, and India. In a September CBC article, a staff member at an Ottawa university (unranked in Canada’s top 50) described the recruitment of foreign students as “fiercely competitive,” indication that demand remains robust even for lesser-known institutions. 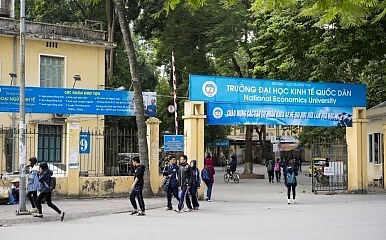 Vietnamese universities are not retreating quietly. Investment in facilities and recruitment of international teaching staff are popular dimensions for competition. A campus construction arms race has recently driven American universities into profligate spending binges on dormitories, sports facilities, and student recreation centers. Many campuses now resemble lavish country clubs, even inspiring new rankings. Not to be outdone, FTP University in Ho Chi Minh City recently unveiled plans for a “green” campus whose architectural grandeur would appear to rival that of the world’s wealthiest universities. Education is typically relevant in discussions about economic growth. No country wishes to be forced into a labor cost war, because the chase to the bottom produces an untenable competitive position. Higher productivity through skill development is therefore a common strategy. However, high value-added production can be as nomadic as low value-added, and the coming decades are likely to see increased global competition for investment as educational attainment spreads. In economies like Vietnam, industrial production – regardless of its value level – is still driven directly or indirectly by foreign firms. Even a move up the ranks of production value does not change the fact that many industry jobs, including those taken by university-educated engineers, are offered by foreign owner-investors with little interest in host countries besides their labor cost advantage. How can a country move beyond this cycle of value-added leapfrogging? High-skill production is ultimately still “line” work; it is neither management nor ownership. Transformative economic growth will not occur until the means of production are owned and managed more by domestic firms than by foreign firms. This is not to suggest that foreign firms have no place in Vietnam. However, the increased presence and competitiveness of domestically owned firms would better circulate profit and capital back into the Vietnamese economy; the country could move away from its reliance on outsourcing and towards self-sufficiency. This perspective advocates neither isolationism nor protectionism. Stronger domestic firms can and should exploit international markets and invest abroad. The absence of trade restrictions and industrial subsidies would also keep competitive pressure on these firms to innovate. To this end, building domestic firm capacity should be a ground-up endeavor, supported by quality education and pro-developmental public policies. The question is how education can contribute to achieving this goal. Vietnamese students must think entrepreneurially, and the country’s university system should prepare them accordingly. The recent proliferation of business programs – many in for-profit institutions – does not seem to be slowing the exodus of Book People. In a 2013 article, a former RMIT-Vietnam president expressed his surprise about the number of RMIT graduates starting their own businesses. Perhaps Western-style education (within or outside Vietnam) attracts people who are already entrepreneurially inclined, but the skills learned in foreign universities may also be shaping students’ career strategies and business philosophies in new ways. Vietnam has made remarkable economic progress since the 1986 Doi Moi reforms. Growth would not have been possible without the ingenuity and ambition of the Vietnamese people. Indeed, the country recently improved its global ranking by 19 places (to #54) in the World Intellectual Property Organization’s global innovation index. Further, the country’s secondary school system has recently generated attention for its #12 ranking in the math and science portion of the international PISA tests. However, a worrying portion of Vietnam’s vast and youthful creative potential continues to be lost to the West. Vietnam must work aggressively to boost the image of its higher education system, not only in the global rankings but also among its own citizens. To compete successfully for talent, domestic universities must continue to fine-tune their curricula and instructional style in the more footloose image of Western universities. This is what the market currently demands, and would be an important step towards transformative economic growth. Vietnam Gears up to Divest State-Owned Enterprises in 20182015 Challenges for the Communist Party of VietnamHow Will Falling Oil Prices Affect Vietnam in 2015?Is Vietnam Creeping Into a Succession Crisis?What Does Jokowi’s Win Mean for Indonesia’s Economy?